We continue towards the ultimate goal for the series – the one arm push up. Today we start level 8, Partial Range One Arm Push Ups, one more preparation for the one arm push-up. It might be a mouthful, but this, together with the Level 9 exercise, are important steps designed to allow you to gradually develop strength and technique to push you to the final challenge. So after overcoming the final level of the Uneven Push Ups, continue and challenge yourself with Partial Range One Arm Push Ups. Stop for a second and then press up towards the starting position, as you breathe out. Repeat until you reach your goal. If you notice that the position of your body gets twisted, then your triceps muscles are too weak for this push-up. You must be able to keep a straight line, all the way from your heels to your neck, just like we did for all the previous push-ups. Partial range one arm push up is the 8th level of complexity in our push up challenge. Technique gained from previous levels allows us to move from two arms to just using one arm. This is an important phase. For one hand push ups we need to learn to distribute the body’s weight and find a balance. In this level, since only one arm performs all the movements, we prepare our joints, elbows and shoulders for higher loads. This is the reason partial range one arm push ups are a necessary step in the series and must not be skipped over. Since the depth of motion of the elbow is small, always follow this exercise with some other kind of push ups before ending the session, like the close grip push ups (level 6), where the angle at which the elbow bends is more than 90°. 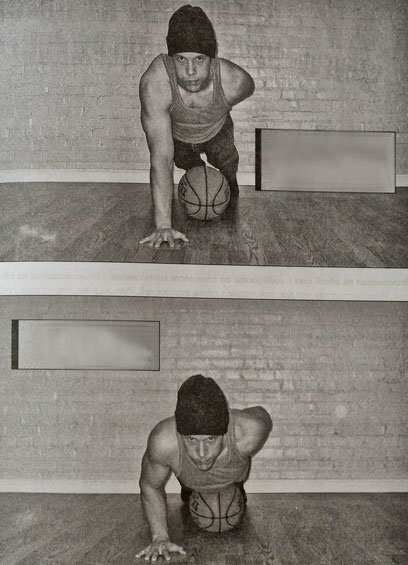 If you have difficulty completing the exercise, try to place the ball at your knees which will lower the depth of your push up. As you progress, keep pushing the ball upwards until you reach the pelvis area. After overcoming the Final Level of the partial range one arm push up, continue with the next exercise – the One Arm Push Ups With Support.